Purchasing a home is typically the biggest financial decision any person will make. Industry experts always recommend working with a Real Estate Professional when in the market to purchase a home. A licensed Real Estate Professional (REALTOR, knows the market trends, areas and most of all the purchase contract. Searching from out of state? We can save you valuable time and expense. Call or e-mail us with the type of home you are looking for, your desired price range, and the general area and amenities you are interested in. We will perform a thorough search for homes that meet your criteria and personally visit them. We will take digital photos or video of the homes from inside and out. Then, I will e-mail them to you for review. I have worked with clients from as far away as Egypt using this process, and it works great! Let us take you on a home tour designed especially for you. Call us to discuss your preferences. Would you like to build a custom home, or buy a pre-existing home? Is your commute time to work a concern? Are you interested in health and golf club membership? There are thousands of communities in and around Phoenix. We have lived and worked in the valley for many years, and know them very well. Let us help you narrow your search and find the home that is perfect for you. Arizona, the Grand Canyon State, offers a diversity of business, educational and entertainment opportunities for people of all ages. Whether you enjoy the desert or the mountains, a warm climate or one a little cooler, you'll find it in Arizona. And I can help make your transition to Arizona an enjoyable reality. I realize that building, selling or purchasing a home is likely to be the single largest financial transaction of a lifetime. My understanding of your concerns, attention to detail, and knowledge of the Arizona home market leave nothing to chance. I offer personal service and expertise to maximize your investment and satisfaction. My primary goal is to find the right property for you. Whether you are considering a secluded, gated mountain community, a golf course townhouse, a patio home or centrally located community, I can provide a wide range of options and am proud of my reputation of service and excellence in meeting your needs. You can depend on me to provide professional excellence for all your real estate needs. Bordered by Utah, New Mexico, California and Mexico, Arizona is the nations sixth largest state. Its 113,417 square miles are divided into three distinct regions - the northern plateaus, the central mountains, and the southern deserts. Each region contains a unique variety of flora and fauna and wide ranges of climatic conditions. The northern plateau is widely known for its incredible canyons, including the Grand Canyon. For two billion years, the Colorado River has been sculpting breathtaking canyons across northern and western Arizona, giving rise to both prehistoric and modern civilizations. Adventures abound in this region, from wild whitewater rapids traverses to gentler but equally enthralling visits to the Havasu National Wildlife Refuge, home to hundreds of animal species. The plateau region comes to an abrupt end at the Mogollon Rim, a distinct geological feature whose upper rim is covered by a vast pine forest. From here the central mountains run diagonally across the state. The mountains average 6,000 feet in height and provide many forests, lakes and ski areas for the recreation-minded. The lower third of the state is home to the Sonoran Desert, containing some of the worlds most unique plants and animals. The legendary saguaro (or sahuaro) cactus, which only grows in this region of the world, can reach heights of 40-50 feet when it attains maturity after 100 years. Many of the natural wonders of Arizona have been preserved in city, state and national parks throughout Arizona. Education plays a major role in Arizona family life. Pre-schools and day care centers abound throughout the state. Primary education maintains a high focus, and Arizona schools are on a par or better than many school systems nationwide. Secondary education also plays a major role throughout the state. Numerous community colleges, the University of Arizona, Arizona State University, and many technical schools provide top quality education to students from all over the country. Arizona maintains a modified open enrollment policy for its education system. If space is available, your child can attend any elementary, middle or high school in the county. Some school systems also vary educational styles by school - for example, parents in Scottsdale have a choice of traditional or open school methods of education. In-state tuition fees for state colleges and universities are very reasonable. Whatever type of education you or your family desire, you can find it within the excellent school system of Arizona. 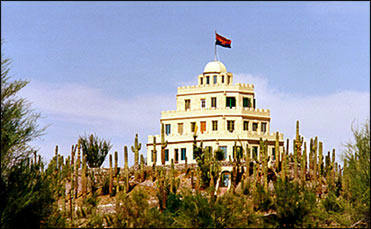 Many of the architectural styles found in Arizona are unique to the Southwest, and have developed as a result of the natural surroundings. Both single and two-story dwellings exist, and stucco exteriors prevail. Most foundations are concrete slabs with either wood frame or block construction, and few homes have basements, which can be difficult to excavate in the hard desert soil. Some of the typical architectural styles you will see include the Santa Fe, Territorial, Santa Barbara, Mediterranean and Southwest Contemporary. In recent years, the Tuscan style of old world architecture has become very popular. Clay or concrete tile roofs, which protect against the summer sun, are prevalent. Many newer homes are equipped with window screens which block the strong rays of the sun or with new low-e glass, and almost all homes are equipped with central air conditioning. Back yard pools and spas are very popular, but many community or neighborhood pools also exist. Numerous gated communities exist throughout the Valley, offering privacy and security. And the many golf course sites available offer a wide range of home styles for the links-minded! Single family homes dominate the Valley, from patio homes to sprawling estates. But for those more interested in the condominium or townhouse lifestyle, your options are wide and varied. Both new home construction and pre-owned home sales are very active throughout the area. Vacant land can be purchased and a custom-designed home built just for you, or you can fall in love with one of the many pre-existing homes already available and ready for you to move in! Due to the rapid growth of the home market in the Valley during the last ten years, the type of environment you desire may be available only in certain areas of town. Scottsdale, Carefree and Cave Creek in particular have implemented certain zoning restrictions that help maintain the unique desert environment we enjoy. The southern portions of Scottsdale and Phoenix offer a desert oasis. These areas were among the earliest to be developed, and exhibit a lush environment with many palm trees, flowers and grass. Known as the "greenbelt" area, a variety of home styles exist (keep in mind that many of the homes are older), and these homes are closer to shopping and entertainment. The northern portions of the Valley exhibit natural Sonoran Desert surroundings. City ordinances have been implemented which require builders and homeowners to maintain a portion of their property as natural desert, and there are restrictions in place which limit plantings to native vegetation. While this may seem restrictive to some, others love the natural desert plants and animals that are evident in this part of the Valley. In addition to the "feel" of certain portions of the Valley, the amenities you desire in a home may also help determine where you decide to look. The Valley has a wide range of home choices and prices. Homes in Master Planned communities tend to look similar (although there are generally several floor plans from which to choose), and lots tend to be somewhat smaller, but the other amenities included, such as community pools, workout facilities and the like may make these the ideal environment for you. Custom home communities typically include larger lots and homes with more square footage, but additional amenities may be limited, and the community may be a little farther from shopping and entertainment. I can help find the ideal location and home for you! Congratulations! Youve made a decision to buy a new home - are you ready for the ins and outs of a new home purchase? The following 25 steps will walk you through the process and ease the transition to your new lifestyle! Write down the features you consider mandatory in your new home. How many bedrooms and baths do you want? Is square footage a consideration? How many garage or carport stalls must you have? Do you want a private pool or spa ? Are you focused on a particular area of town? What about the floorplan? Share this list with me - it will help me to locate properties that meet your needs and will save time. Consider getting pre-approval for a new home mortgage. It will help you focus on properties that fit your financial situation. I can help you through the process. Once you receive pre-approval you will receive a letter from the lending institution indicating your status - share this letter with me, as it can positively impact the acceptance of a Purchase Contract. If you decide to get mortgage pre-approval, shop around for the mortgage that meets your needs. While rates are an important factor, also check for additional fees, prepay penalties, discount points, etc. The type of service you receive from mortgage companies may vary as well. You will need to determine which factors are most important for you and find a company that fits well.I can recommend reputable companies to meet your needs. Talk to your mortgage company about how you wish to pay for the principal, taxes and insurance on any property you purchase. These charges can be grouped together as a single payment, or can be paid separately - the choice is yours. Once you begin looking at available properties, take your list of requirements with you and refer to it often. This will help focus your search to homes that meet the majority of your needs. Share your thoughts about the homes you see with me- and be honest about what you like and dont like! You will want to know if the property you are considering is part of a Home Owners Association, and if so, whether there are monthly, quarterly or annual association fees. I can help you determine this. I will also ask about the current owners status with the Homeowners Association. This ensures that the condition of the property does not violate any of the rules governing the association, and for which you would be responsible after purchase. If the property you want to purchase has a pool, make sure that all necessary safety precautions are in place. Once you select your new home, I will help you prepare a Purchase Contract. It is important for you to understand your obligations and rights before you sign the contract. Ask me to explain to you any points you dont understand. If the property you are planning to purchase is an older home, lead-based paint and asbestos inspections may be called for. I can help you determine if these are necessary. If the home you plan to purchase is not new, consider requesting that the seller purchase a Home Warranty policy, or purchase one yourself. This insures that most major repairs will be covered in the event of failure within the first year of home ownership. A termite inspection is mandatory in Arizona; you must make arrangements to have the inspection completed and allow time for treatment before closing if termites are detected. Once the Purchase Contract is accepted by the current owner, I will open an escrow account, into which your funds (such as down payment) will be deposited. The escrow account is generally held by a Title Company, and it is your right to select the company. I can make recommendations. Some instructions to the Title Company may be necessary - for example, there may be certain conditions that must be met before the transaction is complete. Often these instructions are included in the Purchase Contract, but there may be additional documentation needed. Your Title Company and/or Realtor will work with you to prepare escrow instructions, and you will need to sign them. As soon as your Purchase Contract is accepted, notify your mortgage lender ( I can also do this for you). This allows sufficient time to prepare the necessary documentation before closing. If your new home is part of a Home Owners Association, make sure you receive a copy of the CC&Rs (covenants, conditions and restrictions). This will provide you with information about the rules governing the neighborhood. Consider having a home inspection completed on the property. This will uncover any hidden defects in the structure, heating and cooling systems, appliances, etc. Make sure to schedule the inspection early enough to have defects corrected before closing. You will need to decide how you will take title to the property - I can explain your options, along with the escrow company. The Title Company you selected will do a search on the title of the property prior to closing. This search helps to ensure clear and marketable title to the property. You will also be required to purchase title insurance. This insurance provides coverage for certain types of losses due to errors that occurred prior to your taking title. For example, it protects against prior fraud or forgery that might not be detected until after closing and which could jeopardize your ownership status. Title insurance is a one-time charge and is generally paid by the seller; however, it may have been a negotiated item in your Purchase Contract. Just prior to closing, you will receive a settlement statement from your Title Company. This statement indicates all fees and charges that are part of the closing, and identifies how much money you will need to close. For the closing, you will need a cashiers check in the amount indicated by the Title Company; and personal identification with a photo (such as a drivers license). The Title Company will ask you to sign all necessary documents, and will work directly with your mortgage company to obtain the remaining funds. Once they receive all funding, the deed to your property will be recorded and your escrow closed. I will arrange for you to receive the keys to your new home according to the terms of possession noted on your Purchase Contract or in the escrow instructions. You will receive the recorded deed to your home in the mail directly from the County Recorders office, generally within two to three weeks. Your Title Insurance policy will be mailed to you within two to three weeks. If you elected to pay for insurance and taxes separately from your mortgage payment, be aware that you may not receive a tax statement during the first year of occupancy; however, you are required to make sure the taxes are paid when due. I can't wait to welcome you to your new home! Why Order a Home Inspection? Whether you are considering the purchase of a new or resale home, you should seriously consider having a home inspection conducted during the inspection period designated in your Purchase Contract. Buying a home is very exciting - but you may also worry that the home you are about to purchase has defects that you cannot see and that may not become apparent until after you have occupied the home. Once the purchase is complete, most defects will become your responsibility. And even with a brand new home, some things may not be exactly as you would wish. Elements that would probably not be covered include pools, spas, and termites. A separate termite inspection is generally required in Arizona, and is normally paid for by the seller. Home inspections can be paid for by the seller, the buyer, or the cost can be split. Once you move into your new home, you can protect your investment and minimize potential expenses by purchasing a Home Warranty. These warranties protect against defects or failures in some of the major components in your new home for one year. A Home Warranty policy generally costs $350 to $500, and covers such things as the furnace, range and oven, dishwasher, water heater, garbage disposal, built-in microwave, plumbing, and electrical. The cost to repair or replace even one of these items can be far greater than the cost of the warranty. And in some cases, the warranty can be extended for a longer period of time. Items generally not covered include pools and spas, evaporative coolers, washer, dryer, refrigerator, and trash compactor. Many home warranty companies offer expanded coverage for these items at an additional cost. If you elect to purchase a Home Warranty, examine the terms of the warranty carefully so that you understand which items are covered. In some cases, the company may cover only certain components of covered items (for example, the electrical wiring for garage door openers may be covered, but not the door tracks or remote controls). The same may be true of extended coverage for items not covered under the basic policy. The rule of thumb - Read Carefully! A Home Warranty can be purchased as soon as you have an accepted Purchase Contract for a property - and you can ask the seller to pay for the warranty. You can also divide the cost, or pay for it yourself. Ask me to discuss your options and to provide you with the names of reputable Home Warranty companies. What is a point? One point is equal to 1% of the NEW loan amount. Why do lenders charge points? Whenever governmental regulation, state usury laws and/or competitive practices Prohibit the lender from charging a rate of interest which would make the real estate loan competitive with other fields of investments, the lender must seek some method of increasing the yield for the investors. By charging "points", the lender can bring the real estate loan up to those other investments. Are points called by different names? Yes - Loan Origination Fee, Commitment Fee, Discount Fee, Warehousing Fee, Funding Fee, etc. Who must pay the points? FHA: the Buyer is usually charged with the Loan Origination Fee; the Discount Fee can be paid by the Buyer or Seller. VA: the Buyer is usually charged with the Loan Origination Fee and the Funding Fee. Discount Fee must be paid by the Seller. Conventional: points can be paid by the Buyer, the Seller, or split between the two - this is stated on the Contract of Sale. City/County/State government-sponsored loans: as published by the government agency. Do the number of points charged fluctuate? Yes - if rates on mortgage loans are lower than other investments (such as stocks, bonds, etc.) then funds will be drawn away from the mortgage market. Also, when there is a heavy demand upon the money market because of business needs, military requirements or other government borrowing, the result is that money for home mortgages becomes scarce and more expensive. When this occurs, more points can be charged. Points balance the market. Points are not set by government regulation, but by each lender individually. On VA loans, is there any way to lock in the number of points? Not without jeopardizing the sale. Even when a lender stipulates in writing the number of points to be charged, that guarantee states "if the interest rates is not changed by the government". Points charged on an FHA or conventional loans are usually not changed from commitment time to settlement. Is FHA or VA financing unfair to sellers? No. Homes can sell faster because more buyers can qualify with the lower down payment requirement, lower interest rate, and because these are long term loans with low monthly payments. Sellers receive all cash for their equity to reinvest in a new home or other investment. The purpose of these loans is to provide purchasers the opportunity to buy homes with minimal cash investments, thus providing a bigger market for sellers. Are points deductible for income tax purposes? Points on a home mortgage (for the purchase or improvement of, and secured by, the taxpayers principal residence) are deductible currently if points are generally charged in the geographical area where the loan is made and to the extent of the number of points generally charged in that area for a home loan. If you are in doubt about points being deductible you should contact your tax advisor. The southern portions of Scottsdale and Phoenix offer a desert oasis. These areas were among the earliest to be developed, and exhibit a lush environment with many palm trees, flowers and grass. Known as the 'greenbelt' area, a variety of home styles exist (keep in mind that many of the homes are older), and these homes are closer to shopping and entertainment. In addition to the 'feel' of certain portions of the Valley, the amenities you desire in a home may also help determine where you decide to look. The Valley has a wide range of home choices and prices. Homes in Master Planned communities tend to look similar (although there are generally several floor plans from which to choose), and lots tend to be somewhat smaller, but the other amenities included, such as community pools, workout facilities and the like may make these the ideal environment for you. Custom home communities typically include larger lots and homes with more square footage, but additional amenities may be limited, and the community may be a little farther from shopping and entertainment. If you follow our guide for identifying your needs and desires, we can help find the ideal location and home for you!